Anyone who is a regular reader of Niagara’s Watercooler know that all of us in the mothership love hockey. 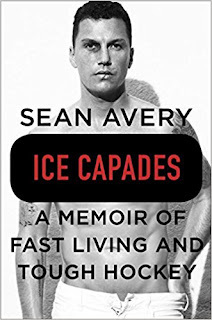 So, when I was visiting the Lockport Library and saw Sean Avery’s memoir on the shelf, I knew that I had to read it. Somehow, the book hip-checked me and bummed a ride home with me. I guess that meant I couldn’t ignore the book sitting on the shelf -- no matter how hard I tried. I’m joking. It’s hockey. I was reading it. I’ll get this off my chest right now. I am not, nor have I ever been a big fan of Sean Avery. I thought he chirped too much on and off the ice. I have to admit, though, that his annoyance of Martin Brodeur was simply awesome. Because of that, the NHL did its best impression of the NFL and made a new rule in the middle of the playoffs to prevent it from happening again. I thought it was a bush league move for a brilliant play. Sean Avery gives people an inside look at the life of a professional hockey player. His blunt assessment of the inner workings of the league and its players was probably not exactly well received by others in the league. Just like his many altercations on the ice, Avery pulls no punches. It astounded me how much partying was going on between games. I always thought that these players were perfect physical specimens of athleticism who spent most of their time training to maintain spots in the lineup. I had no idea how wrong I was. I did learn that the NHL would have probably failed without the presence of Sean Avery. He is just as egotistical on the page as he was one the ice. He repeatedly points out how great the teams he played for were when he was in the lineup, and how much they needed him when he was injured or scratched. That is kind of to be expected. To make it to the professional levels that Avery did, there has to be a pretty high level of self confidence. His description of the NHL drug policy early in his career actually made me laugh out loud. The same goes for his analysis of John Tortorella and Andy Murray, his former coaches. I liked to see the relationships that were formed by sharing ice time. This seemed especially so regarding his friendships with Brett Hull, Chris Chelios, and Brendan Shanahan. This book was a quick, easy read. And it was enjoyable once you waded through the waist-high morass of his egotism. He shows no regret for any of his actions. The one exception relates directly to his relationship with Elisha Cuthbert. He shows genuine remorse for his words after that relationship fell apart. I give Avery full credit for being brutally honest in this memoir. Many people may not like it, especially those people he mentioned. However, it was a refreshing look at the league that is nearly impossible to get anywhere else. I bet Sean Avery would be fun to have on our podcast. He seems to have a sense of humor and we all know he likes to talk about himself. We do, too. And we love hockey. If he’s ever in the Buffalo area, I may have to call him. I’m sure that he could tell us much, much more about life in the National Hockey League. Like I said, he’s not my favorite player, but he’d be a lot of fun to talk with. And, hey, at least he’s not Chris Neil. Craig Bacon loves hockey. And he loves reading. Combine the two and it’s a recipe for a full day of awesomeness.